BC Winterthur (LNA) tabbed 21-year old Sri Lanka shooting guard Vidura Disanayake (181-95). He has played for the last four years at Meyrin Basket in the LNB. In 12 games he averaged 8.6ppg, 1.1rpg, 2.0apg and 1.7spg last season. 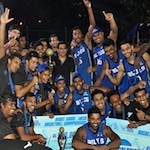 Disanayake helped his team to make it to the LNB Final in 2016. Sri Lanka played Bangladesh in their opening game of the South Asian Basketball Championship 2018 (SABA 2018), which acts as the pre-qualifier for the Asia Cup 2021. The SABA 2018 is played in Dhaka, Bangladesh. The Lankan lads getting the ideal start for the campaign drowned the home team at full time, 65-34. Even though Bangladesh walked into the game after a win and being the home side, played some disappointing basketball against Sri Lanka. Sri Lanka on the other hand identified the weakness of the opposition early and exploited them well one after the other. Sri Lanka created a balance between their offense and defense during the first two quarters and tightened the screws for the home team. After the home team was ambushed hard, Sri Lanka capitalized more on their offense during the second half and rubbed the game swiftly across. Bangladesh seemed to have lost the plot entirely in every aspect of the game. The Sri Lankan man-to-man defense completely blocked off the lanes for the hosts to score during their offensive possessions. Bangladesh in their defense struggled as Sri Lanka passed the ball around the perimeter and executed their offensive game plans. Even though Bangladesh did opt for a tight man-to-man defense, the offensive game plans of Sri Lanka always left one man open to take the shot freely. Bangladesh never adopted to it. Sri Lanka went on to score 12 points in the first quarter in reply to the couple by the hosts. For the second and third quarter Sri Lanka went on to add 15 and 19 points respectively. Bangladesh only managed, 07 and 08. Both the teams did score 19 points each, but the early lead helped Sri Lanka to close the game, 34-65. The national Basketball players will begin their duty on the 18th of May in Maldives when the South Asian Basketball Association Championship 2017 kicks off for the fifth time. Looking back at the recent past of the championship, Sri Lanka won the silver in the year 2015 as they lost the final match to the tournament favorites India 93-44. It was unfortunate as Sri Lanka remained unbeaten in the tournament and lost their spot in the Asian Championship that year since only the winning team is qualified from the South Asian Region. The very next edition of the tournament happened in 2016, Sri Lanka said no; we are not going participate. ThePapare.com inquired about the situation at the time and the Sri Lanka Basketball Federation (SLBF) responded that the invitation for the tournament came in short notice and they did not possess enough time and resources to prepare and represent the country in the international stage. A year later, now 2017 Sri Lanka Basketball celebrates 100 years and hearteningly in the last 365 days SLBF have taken measures to right themselves. A national pool is selected and the country is ready with a team for the SABA Championship 2017. It is commendable but there are a few areas that need to be ironed out to make Sri Lanka better at what we do. Of course, all good things do not come easy and the basketball fraternity will hope that SLBF works on its process and ticks the check list one by one make Sri Lanka Basketball great again. So SABA Championship 2017. The 5th edition of the tournament will be held in Maldives from the 19th May - 23rd May. The edition will be at full swing as all the participating nations have confirmed. Sri Lanka has always had a good run with Bangladesh, Bhutan, Nepal, Pakistan and the hosting nation Maldives. The hoodoo for Sri Lanka is India. They are nice neighbours but their giant feet in basketball have been crushing us, no questions asked. India has won the championship three times during the past and Bangladesh has won it once. Sri Lanka National Basketball team is currently engaging in practice sessions for the championship. Out of the 36-member national pool that was drafted in mid-February a fifteen-member pool was selected after a set of trails and the final twelve will be selected from the fifteen-member pool. Even though the national pool was drafted in mid-February there were no practice sessions held for the players until the preparations for SABA began in the recent couple of weeks. Coach Prasanna Jayasinghe speaking with ThePapare.com said, 'We had a chance to better our performance this year because the pool was selected in mid-February but we missed out in practices for two months and until these players were recalled a week ago'. ThePapare.com also spoke with SLBF to ascertain the situation. SLBF's response was that the funds were woefully inadequate for long-winded practice periods required and that SABA had also informed them of the event only around a month ago. So with the challenge at hand to face India how is Sri Lanka preparing themselves after missing out for two months. We questioned the coach. ' We are planning to do around ten practice sessions. We have already finished four. We can't practice at a stretch we have to give a break in between as well. So in total I have planned around 20-25 hours of practice before the tournament. Mostly we are focusing on brushing up their skills and then we will be looking in to their strength & conditioning'. So the next box on the check list for SLBF is to focus on how the selected players will undergo a proper practice session so that they will be in good condition to face tough conditions overseas. The completion will be tough. Since Maldives will be hosting the tournament they will be prepared better this time. 'India of course will be a challenge and then the fight for the silver and bronze medals is between Sri Lanka, Nepal and Bangladesh. Then of course Maldives will also be in a better positon this tournament since they are hosting it. The hope for the tournament will be to secure the silver medal we have not gone down from there and we will try our best to beat India and win it', added Coach Prasanna Jayasinghe. Prasanna & Co. will have to fight a little hard this year as we have missed in preparation time. So let's rally around and wish the boys and hope that the selected pools will get some thorough practice more so that we as a nation will be in a better position when we fly away.